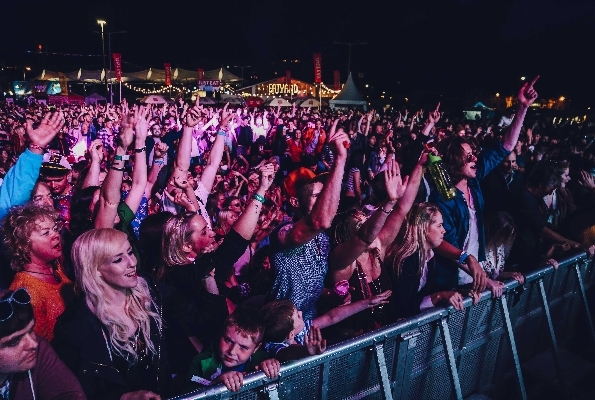 Frances Winston reviews the multi-entertainment 3-day festival that is Beatyard, which took place at Dun Laoghaire Harbour at the weekend, and showed her skills at making crisp sambos to boot! Anyone familiar with Bodytonic’s fab bars, like the Bernard Shaw and MVP, or the amazing Eatyard on Richmond Street, should know that these guys don’t throw an ordinary party. After a few years in different venues around the city, Beatyard finally found its spiritual home in Dun Laoghaire Harbour a few years ago, and it hasn’t looked back. Encompassing everything that people love about their venues and club nights, and their foodie spin-off The Eatyard, The Beatyard is a chillax but lit festival. There is music, food, talks, kids spaces… basically it tries to tick all boxes. It welcomes young and old – literally. Being family-friendly it meant everybody from pretty much newborn babies (with ear protectors) to people of a very classic vintage attended over the course of the three days. I say days, but the Friday was more of an afternoon. Kicking off at 4pm with Jenny Greene, there were only three other acts that night – Family Stone, The Wailers, and The Jacksons. It’s fair to say night one was a total nostalgia-fest. Given the amount of Michael Jackson t-shirts, I can only assume many of the crowd were there for the headliners. But the crowd still showed appreciation for everyone else. I have to be honest, I had forgotten how influential Family Stone were, and was very impressed by them. Ditto The Wailers. Even without their late collaborator, Bob Marley, they blew me and everyone else away. No Woman No Cry, Is this Love, and all the hits were there. However, as I said, it was all about the headliners that night. Many people in the crowd seemed to be projecting their love of Michael on to his brothers – a bit unfair on them, but I’m sure they expect it at this stage. They opened with Can You Feel It, which was somewhat audacious, given how big a hit it was. But they followed through with hit after hit, and one or two indulgent moments (Tito, we know you have an album – we get it) throughout, the spirit of their brother, Michael, loomed large on screens, and they also threw in a few of his solo hits. The dance moves are still there – lest we doubt it, the screens played their young selves in the background, while their more mature selves emulated it. The vocals weren’t always there unfortunately. They tried to replicate everything, but they are men in their 50s and 60s now, and will never be able to hit the notes they did when they were in their teens. That aside, it was totally joyous. They have a polish sorely missing from modern artists. It was so old-skool, classy, and brilliant, that even if you weren’t a fan it was irresistible. However, Beatyeard is a marathon and not a sprint. And on Saturday I was back – albeit after a round trip to Galway for other work, so apologies for the brief review. I only caught Kamasi Washington and Django Django. Speaking to people who were there all day, I was somewhat raging to have missed it, but even this reviewer isn’t omnipotent! However, both acts that I caught were amazing. I’m not gonna lie – jazz isn’t my music genre of choice, but I was extremely impressed by Washington. Ditto Django Django, who are on my radar but not in my favourites. They really did an amazing job. Day three was a totally different vibe again. They went from nostalgia (Friday) to chilled (Saturday) to a dance haven on Sunday. Full disclosure, I was a finalist in the Eatyard Crisp Sambo Championship that day, so I had to be there early, which was great, because it meant I got to see Australia’s Confidence Man. I like their stuff, but not enough to necessarily come out to Dun Laoghaire that early to see them, but I’m glad I did. They were amazing. And kudos to them, because when St Germain (who I was really looking forward to) cancelled, they stepped up to the plate to return to the stage to replace them, before headliners Orbital. Over in Top Deck, Bingo Loco were hilariously brilliant, and totally trashed the place (with glitter bombs – not violence) after lots of great food demos and talks. That’s the thing with Beatyard – there’s always so much going on and not enough words. So I’ll fast forward to the headliners. Orbital gave the crowd what they wanted. They played everything the audience loved, and remixed their classic, Halcyon, with both Belinda Carlisle’s Heaven is a Place on Earth and Bon Jovi’s You Give Love a Bad Name, which the audience went nuts for. And their whole set was fantastic. What ruined it were a certain contingent in the audience. Unlike audiences of the previous couple of days, they were a bit more ‘relaxed’ and seemed to think they were 19 again, with all that encompassed in the rave clubs! I’ll leave that to the imagination, but it was really uncomfortable. That aside, Beatyard remains one of the best boutique festivals in the country. I haven’t even had time to go into all the other spaces, but honestly it is great fun, and there is enough going on to entertain even the most erratic mind. Oh, and for the record, I came second in the crisp sambo championship! And Paul from Orbital was a judge. Bragging rights right there!